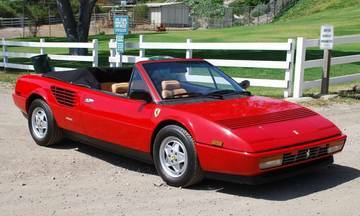 The Ferrari Mondial is an automobile that was produced by Ferrari from 1980 through 1993. It replaced the 208/308 GT4. The "Mondial" name came from Ferrari's history — the 500 Mondial race car of the early 1950s. Despite its predecessor being Bertone styled, the Mondial saw Ferrari return to Pininfarina for styling. Sold as a mid-sized coupe and, eventually a cabriolet. Conceived as a 'usable' model, offering the practicality of four seats and the performance of a Ferrari. The car had a slightly higher roofline than its stablemates, with a single long door either side, offering easy access and good interior space, reasonable rear legroom while all-round visibility was excellent. The cabriolets also hold the distinction of being the only production automobile in history that has four seats, is rear mid-engined, and is a full convertible.